Liverpool Fuel Doctor - Wrong Fuel In My Car! Put Diesel in your petrol car? Put Petrol in your diesel car? Don't panic we can help, we have Fuel Doctors in Liverpool & Merseyside that can be with you within the hour!. 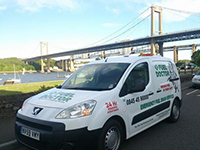 In Liverpool and Merseyside around 40 people a day will put the wrong fuel in their car, our Fuel Doctors are based in Liverpool and aim to be with you within the hour and on your way within 15 to 30 minutes of us arriving. Its why we are known as the Fuel Emergency Service. 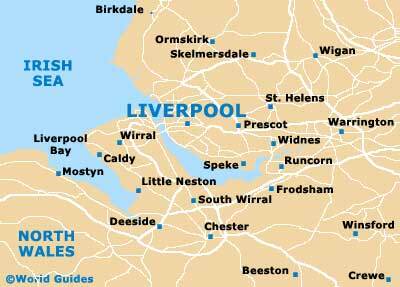 No matter where you are in Liverpool, we have a Fuel Doctor near you. We will be with you within the hour and with you for around 15 minutes. Don't panic, just call us. 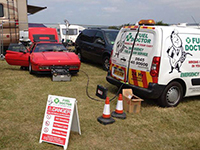 Fuel Doctor are a national company with technicians in Liverpool. If you have put the wrong petrol in your car you can call us anytime of the day and you will have a dedicated local Manchester Fuel Doctor to get you back up and running. Everyday roughly 40 people put the wrong fuel in their car in Liverpool and Merseyside, whether its diesel in petrol or petrol in diesel. It's a very common mistake and easily done, we understand that you need us there fast and to get back on your feet to get on with you life. ​This client put Petrol in his Diesel Peugeot 407 at Tesco Extra garage in Formby, Merseyside. He realised straight away before running the engine so the misfuel was no problem for Fuel Doctor Liverpool. We drained the fuel and had him back on the road within 20 minutes. Our client was Network Rail for this job, there was a big issue with cross contamination of Petrol and water into a Diesel generator for a mobile portacabin welfare unit. ​We drained and cleaned the generator and had it back working in no time so the guys could get back to work. This customer put Diesel in his Petrol Peugeot 50cc Scooter, he had made it to his work address in Liverpool Merseyside but has stalled upon arrival. We dealt with the misfuel within one our and had his scooter prepared for his journey home after work. full tank. The engine had been run and recovered by the AA. We corrected the issue at ESSO in Crosby Merseyside and we had her back on the road within the hour. Tescos store in Haydock, this elderly gentleman put the wrong fuel in his Vauxhall Corsa by filling 25 litres of Petrol into the Diesel tank. 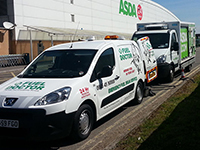 Fuel Doctor arrived on the scene within 20 minutes and the whole problem was rectified in well under an hour. Leaving the gentleman to collect his wife from Church as he was intending before the misfuel. A Civil servant was left stranded roadside in Prescot near Liverpool, Merseyside over the Easter holidays. Diesel was mistakenly put into his Petrol Toyota Aygo car. Fuel Doctor was on the scene 35 minutes after the breakdown and the car back on the road little over an hour later. ​90 Litres of Petrol put into a Diesel tank very nearly ended this Vauxhall Campervan's weekend adventures on a Saturday morning. Luckily his local Mechanic uses Fuel Doctor so referred our Roadside Emergency Fuel Drain Services. Problem solved less than two hours later. A MAN rigid body lorry belonging to a Glaziers company ground to a halt on the first day of the new summer month 1/6/17 at Texaco Fuel in Kirby, Liverpool, Merseyside. A frantic pet owner lost her dog whilst walking in fields near Haydock, Merseyside. 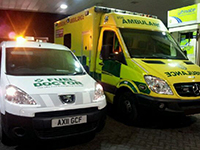 Fuel Doctor Liverpool assisted in a matter of minutes after our services were located on Google. Our Technician Dan dealt with the vehicle roadside whilst the owner continued the search for her pet. Thankfully the lady text Dan a couple of hours later that evening to say the puppy had been found safe and well. Another Happy Customer for Fuel Doctor - Liverpool! "I would just like to say a huge thank you to Dan who came to my rescue in Liverpool yesterday, after putting unleaded into my diesel car! I panicked as I had my 3 young children in the car. Dan rang me instantly after finishing on the phone to my insurance company and was at my location within 5 minutes I couldn't believe it!! He kept me calm and reassured me that everything would be fine! Dan was friendly and has fantastic customer service skills he is a real credit to your organisation, and i really hope he gets the recognition that he deserves. Thanks again Dan!"